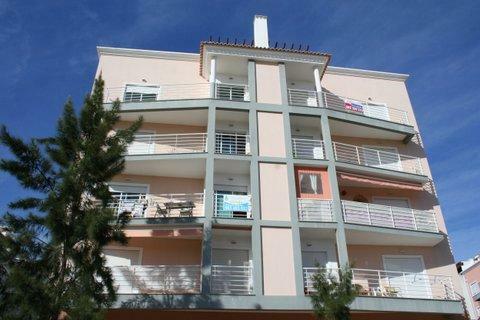 New 2 bed apartments 800m from the beach - Property for sale. Full Description: Armacao de Pera is one of the most popular family resorts in the Algarve famous for its long sandy beach including an area where local fishermen still launch their boats returning with their catch. Not surprisingly Armacao is well known for the quality of its fish restaurants! These new apartments, towards the Western part of the town, are in a quiet residential area only an 8-10 minute walk from the beach front. The building has a secure entrance system and lift or stairs to each level. There are 1 or 2 bedroom options available and each apartment comprises a fitted and partially equipped kitchen, lounge/dining room, full modern design bathroom, and bedrooms with good sized fitted wardrobes and wooden flooring. The balconies or terraces are accessed from the lounge and bedrooms and some incorporate a built in BBQ. Parking is in a private underground garage. These apartments offer well priced accommodation in a good location for permanent residence, long term stays or holidays.